A strong 80-member team was selected and approved by Sports Minister Dayasiri Jayasekera. Sri Lanka Rugby (SLR) has already written to the National Olympic Committee (NOC), in order to change a few players, due to injury worries. But they will need to wait until the organizing committee from the Gold Coast in Australia approves the required changes. Weightlifter Chinthana Vidanage firmly favored to bring home a title at the XXI Commonwealth Games in the Gold Coast, Australia, will lead the 80-member strong athletic contingent. 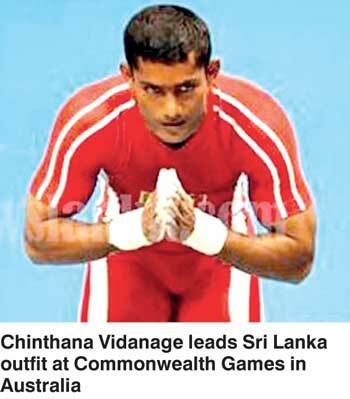 Vidanage won a gold medal in the 62kgs weightlifting event at the 2006 Commonwealth Games in Melbourne, and is the only current gold medal holder in the Sri Lankan athletic team. Vidanage also has a silver medal in weightlifting at the 2010 Commonwealth Games which took place in New Delhi. Meanwhile, in swimming, Dilrukshi Perera from Hillwood College too looks rock solid, along with Akalanka Peiris of St Peter’s. The swimming team received prior training in Brisbane when they left the island on 14 March to receive training for the events.